I have been writing for over 20 years, at the rate of a book a year. To make the results as clear as possible, we have grouped the results as: the Falco series; the Albia series; standalone novels (some of these are set in the Roman period, some during the Civil War). 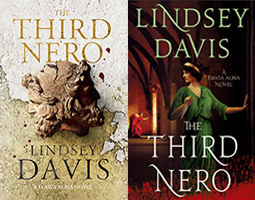 Twenty novels feature Marcus Didius Falco, the laid-back Roman ‘informer’ who investigates crimes and acts as an often reluctant imperial agent. He narrates his adventures in the first person. In the course of the series he acquires a wife, children and dog, plus friends and antagonists. Each novel is written so it can be read individually, but many people like to read the whole series in order to follow the background plot. For that, the chronological order is as we give it here, beginning with The Silver Pigs, which starts with the arrival in Rome of the Emperor Vespasian in 69AD, and ending with Nemesis, set in 77AD. To guide readers through the books, their background and characters, there is also Falco: the Official Companion. This is a new series, first published in 2013. The heroine is Falco’s adopted daughter, Flavia Albia, who has grown from a troubled teenager to a feisty widow and who is an investigator in her own right. The series begins in 89AD, shifting the background from the reign of jovial Vespasian to the darker time of his paranoid son Domitian. Like the Falco novels, these stories are told in the first person, with the often caustic Albia giving us her refreshing new perspective on the traditional Roman world from the viewpoint of a woman and an outsider. Although we see familiar people and places, Albia has her own circle of acquaintances, bugbears and lovers; she has her own past – and her own future. Writing a series is great fun, but from time to time I like to step aside and do something different. All of these novels are more ambitious in scope and more serious than my crime novels. They are told in the third person, from the viewpoints of different characters, and some cover a long period of time. The Course of Honour was in fact my first important novel, though published long after Falco. It serves as a prelude to the Falco series, as does Master and God to Albia. I really wanted to write about the Seventeenth Century, so Rebels and Traitors is a vast book which follows a diverse cast of characters through the Civil War and Commonwealth periods. A Cruel Fate is by design a very short book, taking a concentrated look at the treatment of prisoners of war. For foreign language versions see the Translations page.